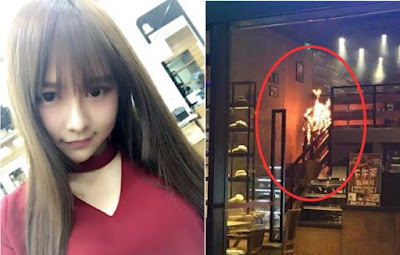 SNH48's Tang AnQi was set on fire by her friend following a fight inside a Baoshan District coffee shop. The idol is hospitalized after suffering burns on 80% of her body. Police officials report the two got into a fight before her friend accidentally set her clothes on fire with a lighter. The idol was soon engulfed in flames. At the time of the incident she wore a down jacket and silk stockings. AnQi was on the 2nd floor of the cafe during the fight. She ran to the stairwell and cried for help as her body was completely on fire. She was rushed to the hospital once the store's staff put out the fire. The idol has 80% burns across her body and is being treated at the hospital. SNH48's management pleaded to the population to donate blood due to the large amount of blood transfusions needed. Police are investigating the incident, but the corner where the two was seated wasn't in the view of the surveillance camera. According to updated reports, it appears AnQi might have set herself on fire. Due to the chaos, it's uncertain if her friend set her on fire or if she somehow did it herself. In a more recent report, SNH48's management will cover AnQi's medical cost due to consideration of her economic situation.